Hike summer or winter, alone or with your hiking club! You’ll love our 9+ miles of trails. 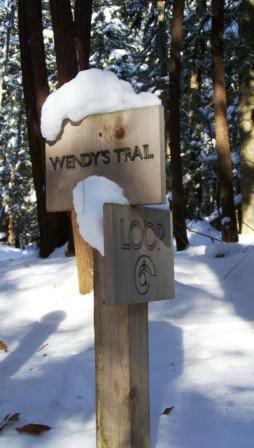 Open dawn to dusk year round, our free trails offer everything from short, level walks to long, rugged climbs. Enjoy deep woods and open meadows, creeks and ponds, and lots of great wildlife habitats. Are you looking for a group to cross country ski, snowshoe, or hike with? These groups organize outings on our properties: Olean Area Hiking Group, Southern Tier Greenway Hiking. Please practice Leave No Trace while visiting. Open dawn to dusk, year-round. Lilibridge is open year-round. Eshelman is closed during hunting season (generally November-Mid December). There are no admission fees. Your membership and/or donations are greatly appreciated. Become familiar with the trail map and plan your walk. Check to see your cell phone works from the site in the event of an emergency. Insect repellent can be helpful in the woods. Watch for changing weather conditions. The old-growth forest sheds dead wood from overhead tree limbs during windy conditions. During thaws, swollen streams block trails. Eshelman is not handicapped accessible at this time. Lillibridge has an accessible interpretative trail. Parking areas are located a few steps from the trail heads. Both areas will accommodate approximately 20 cars or 4 buses. No overnight parking is permitted. Horses, snowmobiles, and motorized vehicles are not permitted on our property. No camping is permitted at either site at this time. Inspect your picnic areas for trash/spilled foods. Carry out all trash, food, & litter. Both properties have seasonal port-a-potties. Otherwise, if nature calls, deposit solid human waste in cat holes dug 6 to 8 inches deep at least 200 feet from water, buildings, and trails. Cover and disguise the cat hole when finished. Carry out toilet paper and hygiene products. Preserve the past: examine, but do not touch, cultural or historic structures & artifacts. Leave rocks, plants and other natural objects as you found them. Lillibridge is home to both protected and endangered species. Avoid introducing or transporting non-native species onto our properties. Campfires are not permitted. Charcoal fires are permitted in the Lillibridge pavilion BBQ. Protect our forest from the Emerald Ash Borer and other pests! Do not bring wood onto the property or remove wood from the site for fires. Remove all BBQ ash & debris from the property after use. Control pets at all times, or leave them at home. Pick up after your pets.